Yes! You heard it right. The cheapest sale for gadgets is here and you can also enjoy this sale with heavy discounts, Reward Points, and FREE Gifts from GearBest as well. Forget the Black Friday Sale, the 11.11 sales are much bigger than it and is showering huge offers and discounts for every customer. 9 Times as compared to the previous Black Friday Sale, the 11.11 has made $14.3 billion dollars’ worth revenue online, and this time it is going to be more amazing with GearBest. Massive sale on Smartphones, Mobile Phone Accessories, Tablets, & TV Boxes, GearBest is going big this time. This Flash Sale is a 1-week long sale and starts from 7 November to 14 November 2016. FREE Gifts, Points, and Discount Coupons for every customer with leading electronics Cube iWork11 Tablet PC and Oukitel U15 Pro 4G Phablet. The main attraction or the EPIC Sale with gigantic discounts will start from 9 to 14 November 2016. This post is not just a promotional article sale but has the most important topic, how to get the most out of this Flash Sale from GearBest? So, let’s start with all tips and tricks that will help you to avail discounted deals completely. To make the most out of this sale, GearBest has divided the 11.11 Flash Sale into three parts and you can easily profit every single one of them. Before going deep into all the tips to secure all the big discounts, let us get a peek of all the foreground details about this sale. The sale starts from 7th Nov with the heavy discounted deals at 16:00 UTC. Being an international website, you’ll to look out for the time zone accordingly. Be precise with the time as the best offers vanish in the blink of an eye. It’s time for the 11.11 Shopping Festival and that means coupons! The PANIC Buying Coupons are only available in limited numbers, so if you’re planning to buy any electronic device then this is the time. Moreover, the Brand Coupons are offering 10%-16% OFF on all the leading brands and the category coupons for all the popular categories on GearBest. You may be wondering that how you would avail a deal for you when there are so people looking for the same deal as you. Psssssst! Here’s a special tip from me. In the past few years, I’ve disappointed myself of having slow hands and Internet connection while grabbing the deal on every flash sale. Guess What! You can use a Browser Extension to the job for you. The Flash Sale Tricks is a Chrome Extension that syncs the time with your device’s clock and automatically clicks “Buy Now” button to checkout. Win a Xiaomi Mi5 in the Gift Rain for FREE! It really pouring discounts and free stuff with GearBest’s Gift Rain Deal. FREE Stuff, Points, Heavy discount Coupons all showering in these limited days. The main attraction of this sale the FREE Stuff like Xiaomi Mi5 Smartphone, Teclast H10 Smart Wristband and much that will be distributed at specific times only. First, you need to spread the word about the 11.11 Flash Sale on Social Media like Facebook, Twitter, Google Plus, etc. The Coins will rain only at specific timings, so you need to watch the Sale timings. Please note that all these rains will last for 3 minutes only. Be fast before they disappear forever. One tip is to set the reminders 5-10 minutes before the Gift Rain commences. Also, you can check the availed coupons in your account and the gifts that you received. 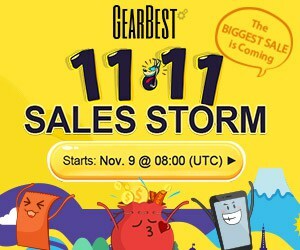 The 11.11 Sale Storm starts from November 9 – 14. So, be prepared to grab all the awesome bargains that you can avail. The Daily Sale would start at 16:00 UTC each day but the products stock out pretty quickly. Be FAST or CRY FOREVER! Exclusive brand clearance discounts for tons of categories to choose from. GearBest has amazing deals for all the Major Electronic devices. There are special sales from American & European warehouses as well. 60-70% discount on major brands and electronic leaders like MI, etc. You can get more discount and coupons related information on GearBest’s Promo Section for 11.11 Flash Sale. So, this was all about the storming sale that will shower you with huge discounts, FREE Gifts and even a Free MI Smartphone during the sale. Be sure to sign-up on the website and create a verified account prior to the sale. Do let us know if you’re enjoying the sale in the comment section and let us know if you’ve won any FREE Gift from the website.